Instruments on ocean-observing satellites show the ocean surface to be much more dynamic than is indicated by maps and charts that portray ocean conditions averaged over decades. Satellite images show that the ocean is turbulent in much the same way that the atmosphere is turbulent. For example, relatively swift western boundary currents can spawn large turbulent rotating warm-core and cold-core eddies, also known as rings. A ring forms when a meander in a boundary current (or the Antarctic Circumpolar Current) becomes a loop that pinches off (separates) from the main current and moves independently as an eddy. Currents bordering a ring can rotate at more than 1.0 knot (1.0 nautical mi per hr or 1.15 mph or 1.86 km per hr), essentially isolating waters and organisms in rings from surrounding waters. Rings extend to some depth in the ocean and should be thought of as cylindrical pools of rotating water rather than simply surface features. 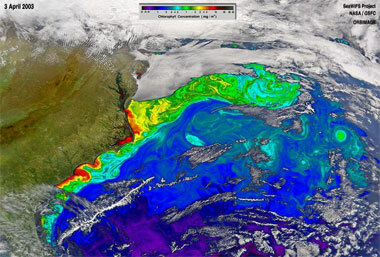 As the Gulf Stream flows eastward it forms meanders that occasionally pinch off to form clockwise-rotating warm-core rings to the north and counterclockwise- rotating cold-core rings to the south. Excellent examples of ring formation and dissipation are found on either side of the Gulf Stream. On the north side, rings are typically 100 to 200 km (60 to 120 mi) across. These rings enclose warm waters from the Sargasso Sea located to the south and east of the Gulf Stream; thus, they are called warm-core rings. Viewed from above, these warm-core rings rotate in a clockwise direction. Because of the strong contrast in sea-surface temperatures, they are readily detected on infrared satellite images. Warm-core rings are also readily distinguished from the surrounding surface waters by their relatively low levels of biological production. The pool of water in a warm-core ring can extend to a depth of 1500 m (4900 ft) so that they cannot move onto continental shelves, which are shallow typically 200 m (650 ft) deep or less. However, rings can come close enough to the shelf edge to modify coastal currents and bring unusual organisms onto the shelf. Occasionally boaters and fishers in normally cool coastal waters encounter organisms (e.g., sea turtles, tropical fish) that live in much warmer water having been transported in a warm core ring that spun off the Gulf Stream. Rings that spin off the south side of the Gulf Stream entrain relatively cold and productive coastal waters and are called cold-core rings. These rings have diameters of about 300 km (185 mi) and, viewed from above, rotate in a counterclockwise direction. Cold-core rings are more difficult for satellites to track because their originally cool surface water is warmed by absorption of solar radiation so that they become almost indistinguishable thermally from surrounding surface waters. However, cold water persists below the surface, sometimes extending down to the ocean floor at depths of more than 4000 m (13,000 ft), and can be detected in vertical profiles of temperature and salinity obtained by instrumented probes. Cold-core rings usually contain more nutrients and marine organisms than the biologically barren Sargasso Sea waters that surround them. Thus, they can also be identified in the subsurface by their unusually abundant marine life. Rings in the North Atlantic move slowly (5 to 6 km or 3 to 4 mi per day), drifting southwestward in the weaker currents on either side of the northeast flowing Gulf Stream. The proximity of the Gulf Stream to the coast limits the southward movement of warm-core rings. Typically, after a few months to a year, a warm-core ring becomes caught between Cape Hatteras, NC and the Gulf Stream; the ring is then reabsorbed back into the Gulf Stream. Cold-core rings are not as restricted in their movements as warm-core rings and may persist for several years; on average, individual cold-core rings last for one and one-half years. Some of the ocean's largest warm-core rings--with diameters up to 400 km (250 mi)--form in the Gulf of Mexico. These rings spin off the Loop Current at highly irregular intervals ranging from several months to 1.5 years. The Loop Current enters the Gulf from the Caribbean by flowing through the Yucatan Strait between Cuba and Mexico, heads northwestward in the general direction of Louisiana, then makes a clockwise turn, and exits the Gulf through the Straits of Florida (between Florida and Cuba). Rings drift westward across the Gulf at 2 to 5 km (1.2 to 3.1 mi) per day. Bordering currents of up to 4 knots (4.6 mi per hr) can play havoc with offshore oil platform operations, damaging equipment and increasing the risk of accidents. Rings form in all ocean basins. For example, the Agulhas Current, the Indian Ocean's western boundary current, is a source of rings. This relatively fast southward-flowing current averages about 7 km per hr (4 mph). As it reaches Africa's southern tip, part of the current is caught up in the eastward flow around Antarctica and abruptly shifts direction back into the Indian Ocean. Some of the flow continues around South Africa as narrow (50 km or 30 mi wide) filaments that cool rapidly and mix with the surrounding waters in the large upwelling zone off Africa's Namibia coast. The Agulhas Current periodically sheds rings about 320 km (200 mi) across from its westem most end. Rings in the Southern Hemisphere rotate in the opposite direction of those in the Northern Hemisphere. The Agulhas Current's warm-core rings rotate counterclockwise and contain Indian Ocean waters that are about 5 Celsius degrees (9 Fahrenheit degrees) warmer than nearby South Atlantic surface waters. They retain their identity as they move into the South Atlantic and transport heat, salt and organisms from the Indian Ocean into the South Atlantic. Over a two-year period in the mid-1990s, 14 of these rings formed.